Here are some rice recipes that you will hopefully find interesting. Rice is the staple food for more than half the world. It is a good source of starch, gluten free carbohydrate (making it suitable for people with wheat intolerance) and it releases sugar in the blood stream slowly, making it good for diabetics. There are many ways to cook rice. The method you adopt for cooking rice depends on the type of rice and the kind of rice recipe you choose to make. For instance, certain recipes involve only par boiling of rice, as in the biryani. On the other hand some recipes are best when rice is sticky or on the contrary (fluffy). Generally, short grain rice is very starchy and best cooked by absorption method (explained below), so that it remains moist and sticky after cooking. The long grain is more dry and fluffy after cooking. For example the basmati rice, widely used in biryanis and pulaos. As a rule of thumb, wash, soak and then cook the rice. Soaking rice prior to cooking, saves fuel and reduces the cooking time. For basmati rice, soaking is essential because it results in longer grains which is necessary for Pulaos and Biryanis. Washing and soaking can be done in a simple manner. You might say, this is no rocket science. Well, you are right, it isn't but I thought it is good to touch this topic very quickly. So here we go. Put the rice grains in a large bowl and place this bowl under a tap of running water. When it gets filled, swirl around the rice grains with your fingertips until the water becomes milky. Drain and repeat until the water runs clear. Alternately you can also put the rice in a strainer and wash nicely under a tap of running water. Once washed, fill more water in the bowl until all the rice grains submerge at least an inch under water. Let it soak for 30 minutes or so. For brown rice or sticky rice, soak for at least two hours. Wash and soak the rice as described earlier. Add the soaked rice and about 6 times more water in a big vessel and allow to boil vigorously. Once boiling, reduce the heat a little, so that the water is still boiling but not spilling over. It will take about 15-20 minutes until the grains are cooked. Take a clean spoon and carefully (don't get burned) take out a few grains to check if they are cooked through. If you think a little more cooking is required then boil for a few more minutes. Just make sure that there is ample water in which the rice is rapidly boiling. In case the water is less, you can top up with some more boiled water (not cold water). When the rice is cooked, strain it in a colander or strainer and let all the water drip out. You can even rinse the rice with boiling water to get rid of the excess starch and you will get nice fluffy rice. One most important tip to remember in this method is to use a heavy bottom vessel, so that there in no chance of rice getting burned at the bottom. Take double quantity of water to rice for this method. So for 1 cup rice take 2 cups of water. If you have presoaked the rice for 30 minutes, you may want to use a little less than 2 cups of water. Otherwise the rice may come out too mushy and sticky (unless you like it that way). In a vessel add the water and rice (also salt if you want to, I normally avoid). Bring the water to boil and then simmer for 15 minutes or until all the water is absorbed by the rice. If the rice is not fully cooked, just turn off the heat and cover with a tight lid. Rice will get cooked in the steam. If you have a bamboo steamer or any non electric steamer, obviously following the manufacturers instructions is the best thing to do. Although the method of steaming is to place your steamer inside a bigger vessel, filled with water. The water should not touch the bottom of the steamer. In case of a bamboo steamer it is advised to put the rice inside a muslin cloth and then in the steamer. Close the steamer lid and steam for about 15 minutes, then check if rice is done. If not, cook a little longer. In case the water is evaporating faster from the big vessel, refill with a little hot water. Sometimes steaming can also be done by putting the rice in a strainer and placing the strainer over a pot of boiling water. The strainer should just rest on the rim of the pot. Cover the strainer with a lid and let the rice get cooked in the steam coming from the pot underneath. This should again take about 15-20 minutes to cook the rice. In either case don't forget to soak the rice for at least 30 minutes. To achieve good sticky rice, soak the rice for at least 2 hours and use the right type of rice (basmati or jasmine rice will not give good results). Cooking in a pressure cooker will save both your time and fuel. Quick rice recipes like khichdi, pulao, jeera rice or even plain boiled rice can be easily made using a pressure cooker. For any raw rice which is washed and presoaked, you can use 1-1/2 cups of water to every 1 cup rice. For rice like basmati, just 1-1/4 water to 1 cup rice is sufficient. For simple boiling, add the water and rice in the pressure cooker and place the lid. Cook on a high flame till the pressure builds up and the whistle blows. Immediately turn off the heat and let the rice rest in the cooker till the pressure settles down. This is an easy, hassle free and hands free ;-) way of cooking rice. Just put the rice and water inside the electric cooker and switch it on and forget about it. It will automatically turn off and even keep the rice warm. In India electric cookers are a must have appliance in many households. Matar Pulao Recipe - Peas Pulao. Chicken Risotto - An Italian recipe. Paella - Spanish rice recipe, with chicken, prawns and mussels. Rice Pudding - Low fat dessert with fruits. Kheer - An Indian dessert. There are many varieties of rice available throughout the world. In India alone there are some 2,00,000 variety of rice that are known to exist. In India the most popular rice is the aromatic basmati rice, mainly grown in North India. Another short grain rice is sona masoori. In Tamil nadu, Ponni rice is very famous. Boiled rice is also very popular in southern India. In fact 90 percent of the world's rice is grown in Asia, where rice is a staple diet. Rice is consumed for breakfast, lunch and dinner. Topmost rice consuming countries are China, India and Indonesia. * Long grain - Mild in flavor. The most widely used type of white rice. * Basmati - Mostly used in Indian rice recipes, basmati rice comes in both white, parboiled (sela) and brown variety. * Brown - When the chaff is removed from the rice seed but the bran layer is left intact, it is called brown rice. It has a slightly chewy texture and a mild nutty flavor. Takes longer to cook. * Short grain - This is almost a round grain rice. It is very starchy and absorbs a lot of liquid. For this reason it is used in puddings and risottos. An example will be Arborio rice, an Italian variety, used rice recipes like risotto. * Wild rice - This is not a true rice but an aquatic grass from the USA. This also takes longer to cook. * Boiled Rice - This is actually a parboiled rice. When the chaff or outer husk is removed, that time the rice grains are given a quick boil in big cauldrons (this is the way they still do in south India). What happens in this process is that many nutrients are sealed in the grain itself. Like vitamin B and thiamine. The rice is then dried and milled further. But the rice is not the same as the white rice, for it has more nutrients. Even the color of this rice remains yellow instead of white. It takes longer to cook and the grains don't become brittle. So what is the difference between white rice and brown rice? When the chaff is removed from the rice seed, whatever is left is called brown rice. The husk and germ remains intact. Whereas, the white rice is produced when even the bran and germ are removed (the next 2 layers under the husk). So white rice is really the endosperm of the rice seed, full of starch. Although both brown and white rice have similar amount of protein and carbohydrate, but the white rice lacks some of the nutritive values of brown rice. Many vitamins and minerals are lost in processing the white rice, such as vitamin B and magnesium. Since brown rice contains more fiber, it is better for people with bowel troubles. Besides being consumed as rice grain, raw rice can be ground into fine flour. This rice flour is also used worldwide to make many rice recipes. In India the main rice recipes that are made out of rice flour are puttu, idiaapam, appam, unni-appam etc. Rice is soaked and grinded with urad dal and then left to ferment. This forms the batter for the ever famous rice recipes like dosa, uthaapam and idli. Another form of rice which is eaten in India is puffed rice, which is considered as a healthy snack, to kill your in between meals hunger pangs. Then there is flattened or beaten rice (chiwda) used for rice recipes like poha. Flat rice flakes come in two varities, one is white made from white rice and the other is brown, obviously made from brown rice and for this reason is more healthy. * Rice is a good source of energy as it comprises of 77% (approx) carbohydrates. * Rice contains important nutrients including vitamins E and B, Proteins and minerals like potassium and magnesium. * Rice is gluten free, so it is a healthy option for people with gluten intolerance with wheat and other grains. * Rice is good to keep the bowel healthy. In fact it is a natural medicine to treat stomach disorders. Rice recipes like khichdi and kanji are given in cases of gastroenteritis and diarrhea. * Rice is easy to digest, low in fat, low in cholesterol and is a good form of complex carbohydrates. Important note :- Please read carefully the difference between white rice and brown rice. Cooking jeera rice or known as cumin rice is no big deal. 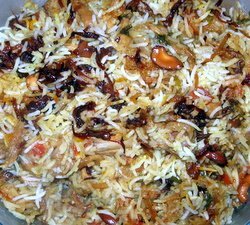 In fact it is one of the simplest rice recipes in India. But this rice is very multi functional. You can serve any curry with it or have it with a dal and raita. The cumin seeds impart a nice aroma to the rice. For best results, use basmati rice and always soak the rice for 30 minutes before cooking. Heat oil or ghee in a cooking pan, add the cumin seeds. Allow them to crackle a bit and when they impart a nice aroma, add the peppercorns and cloves. Drain the rice and add in the oil. Roast on a high flame for a minute or two, in order to coat the rice grains with the oil. Add the measured quantity of hot water, salt and garam masala. Allow the water to boil (this will take only a minute, as the water is already hot). Reduce the flame, cover and cook for about 15 minutes. After 10 minutes open the lid and gently stir the rice in a way that the bottom layer comes up. Cook for another 5 minutes. Check if rice is cooked. Turn off the heat and let it stand for 5 minutes. Now serve hot with a curry of your choice. If cooking in a pressure cooker, reduce the water to 1 and 1/2 cups. Turn off the heat as soon as the pressure starts building. Let the pressure settle down. By the time you open the cooker, the rice will get cooked. Variation :- Slice a onion and roast in the oil till it turns brown, before adding the rice. For different flavors you can also add a bay leaf and cinnamon stick (1/2 inch) in the oil along with the cloves. Heat just 1 tsp oil in a frying pan, add the beaten eggs and spread evenly to make a thin omelet/pancake. Cook for a minute and flip over and cook for 30 seconds. Remove when done and shred into small pieces. Add the remaining oil to the same pan and add the onions. Saute till slightly brown and add the shrimp and red chili. Stir continuously, until the shrimps turn pink. Add the carrots and mushrooms and cook for another few minutes. Now add the soy sauce, sugar and salt (only if required). Add the cooked rice and mix well. Cook until heated well. Garnish with chopped spring onions and shredded egg. Serve hot.